Hours before President Trump will reportedly sign an order preventing most refugees from entering the US, the Department of Defense tweeted a compelling story about an Iraqi refugee who served in the US military. It leaves us wondering: Hey, is the Department of Defense subtweeting the president? 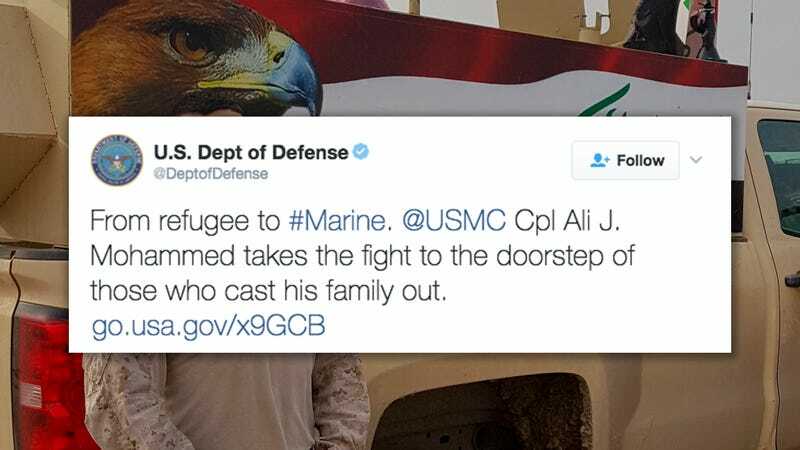 Then, at 8am this morning, the Department of Defense tweeted a link to a story on the official Marine Corps site about Cpl Ali J. Mohammed, a refugee from Iraq who joined the Marines in 2014. The tweet came two days after another Department of Defense tweet, which noted that “Social media postings sometimes provide an important window into a person’s #mentalhealth.” While this was clearly a statement about the ongoing issues of mental health in the military, as the linked post indicated, some questioned whether it was intended as a dig at Trump. Whether or not the Department of Defense was subtweeting Trump this morning, the tweet itself serves as a strong example of the dedication and courage of a Middle Eastern refugee. And as we know, Trump gets very upset about tweets. Let’s hope it spoils his Big Day. Reached by phone, a Department of Defense spokesperson did not immediately comment. We’ll update our post if we hear back.